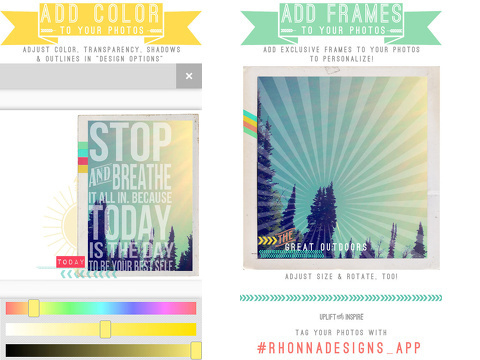 Rhonna Designs iPhone, iPod Touch, and iPad app adds text and graphics to your digital photographs and incorporates sophisticated, precise photo editing tools that elevate your photos to Pinterest-worthy memes. The vast, impressive number of fonts, graphics, and tools are organized well and manipulated with intuitive gesture controls. This is not just a digital version of scrapbooking, but it could be a coveted, inexpensive marketing tool for business owners and public relations folks with limited graphic design skills. The opening screen for the Rhonna Designs iPhone app is wicked and impressive. The thumbnail images scroll horizontally, as the horizontal lines move down the screen vertically. The movement is dynamic and multi-dimensional. In the lower third of the screen, you will find a static row with camera roll, camera, and heart icons. Touch camera roll, authorize access to photos, and a new screen is available with Rhonna backgrounds and all of your existing photo albums. The camera roll opens the in-app camera with basic iOS camera features. The heart icon lets you send love and view tutorials. From camera roll, you select a photo and enter a step-by-step editing process. The first screen gives you a chance to crop the photo. You use simple pinches and extensions to zoom and expand. The menu bar at the top of the screen has three icons with awesome graphic arrows to describe the tools and functions. The T icon allows you to add text and change font. There are four different packages of fonts with each package featuring 10 or 11 fonts and 25 plus colors. There is a style of font that would suit a variety of aesthetics, but they do tend toward a more polished, traditional, and Pinterest style. Menu bars are added to the bottom of the screen with fonts and colors. You swipe horizontally and tap on your selected color and font. You drag the text box on the photo to your desired location, and you can create the size of the box with pinch and zoom gestures. You are instructed to double tap the text box to add it. A keyboard appears, and you enter your text. The icon with three horizontal lines lets you change between left, right, and center justification with a tap. You can also touch the plus icon in the upper left corner to add another layer of text with the same tools. The list icon in the upper right hand corner when you edit text or graphics gives you a chance to use additional, exciting tools. A touch on the fine tune icon gives you a chance to adjust the location and size of the text box or graphic with greater accuracy by moving your finger along volume-style adjustments. The transparency icon allows you to soften or darken the color of the text and graphic with your finger on a volume adjustment. The shadow icon allows you to adjust the shading. You can add an outline to your text and adjust the thickness of the outline as well. The flower icon gives you access to design packs. There are more than 25 packs that are included in the download from the iTunes App Store. You can also purchase additional ones from within the app, and the current rate is 4 for $.99. The design packs are grouped according to theme – banners, celebrations, goals, kiss, love, quotes, tags, travel, and more. The graphics are crisp and well-designed. The graphics interface uses similar tools and gestures as text editing. You position the graphic with your fingers, adjust color, and perfect it with the same tools from the list icon mentioned previously. When you have completed the editing process for text and graphics, the list icon in the upper right corner gives you a chance to adjust the entire photo. You can re-crop, add one of nine filters, and select from more than 30 frames. The mask icon has an interesting function, as you can create that dreamy, foggy texture to the photo. When complete, you can share using iOS sharing interface to Twitter, Facebook, Instagram, and email. 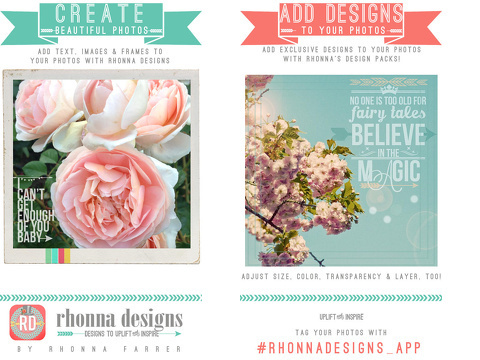 The Rhonna Designs iPhone, iPod Touch, and iPad app has remarkable tools, features, graphics, and fonts to enhance your iOS photography. It is a great tool for small business owners and marketing pros who create memes and online marketing for Facebook and Pinterest. It is easy to use, and the results have a professional touch. I grabbed it as a free download, but it is easily worth the $1.99 download from the iTunes App Store. AppSafari review of Rhonna Designs was written by Jenni Ward on September 9th, 2013 and categorized under App Store, Enterprise, Fun, iPad apps, Photos, Social, Universal, Utilities, Video. Page viewed 3866 times, 2 so far today. Need help on using these apps? Please read the Help Page.